Built in 1923 by Captain Thomas Jefferson Reynolds, the Majestic joined a series of showboats cruising the rivers bringing entertainment to isolated communities like Point Marion, and Brownsville on the Monongahela to Pittsburgh and all the stops along the Ohio. When the showboat game to town it was not just an event it was the event. Wether it arrived brightly lit at night or during to the mid afternoon sun, you heard it long before it was in sight. Its steam calliope was an exciting change to the daily sounds of most towns. The music rolled down the river echoing up the hillsides and with each bend it grew louder and more exciting. By the time the Majestic docked, everyone in town knew it was there and plans were made for the nights performance. My father was able to get a ticket to one of the shows and he would remember the experience his entire life. Not everyone was able to get those tickets, but for the younger visitors, there was a special price for admission, coal. A bucket or basket full would allow a youngster to see the entire show. It was the fuel that kept the steam powered calliope working. 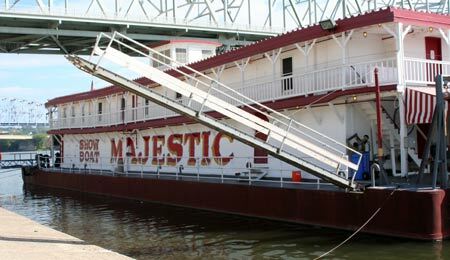 The Majestic was just one of the 50 showboat barges built from 1831 to 1929 and with its stern wheeler companion, the Attaboy tug, they competed with circuses, traveling vaudeville shows and other drama platforms up and down the Ohio River. Today the Majestic is alone and stands as the last of the showboat barges. It is registered as a National Historic Landmark and is moored on the Cincinnati river front. Although the wooden hull has been replaced with a steel one; 90% of its original structure remains in tack. Its length is 135' and has a beam of 40' and will displace 5.9 gross tons. Its giant powerhouse of a partner the Attaboy unfortunately burned in its dock some years ago, but as they say: the show must go on. So it does, the Showboat Majestic still excites audiences with its plays and musicals performed May through December allowing us yet another glimpse into those simpler times. We have all heard the sound of the calliope. It is the sound of the circus or a merry-go-round. It has a distinct aura and when it plays people listen, something exciting is about to happen. Most of the calliopes that exist today were built by one man, Thomas J. Nichol. Mr. Nichol worked for the Van Duzen foundry in Cincinnati making church bells and steamboat whistles. His experience proved that bells made with copper had a sweeter ring. It is not surprising that when he went into business for himself he would build calliopes using rolled copper. In 1923 Thomas Nichol made three calliopes known as the Three Sisters. The first was for the showboat Water Queen, the second was installed in the Majestic and the third was for the Idlewild. The Water Queen sank in 1939 but the calliope would be saved and is today on board the Delta Queen still entertaining passengers along the Ohio. Thomas Nichol would build calliopes in Cincinnati from 1890 to 1932.